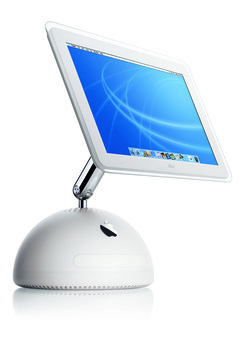 The Apple iMac G4/800 - MacOS X Only (Flat Panel) features an 800 MHz PowerPC 7445 (G4) processor with the AltiVec "Velocity Engine" vector processing unit and a 256k on-chip level 2 cache, 256 MB of RAM (PC133 SDRAM), a 60.0 GB Ultra ATA/66 hard drive (7200 RPM), a tray-loading 32X "Combo" drive, and NVIDIA GeForce2 MX graphics with 32 MB of DDR SDRAM (AGP 2X support). Apple warned that "PC100 RAM is not to be used with this Mac and may create performance and reliability issues"
Details: The PowerPC G4 includes the AltiVec "Velocity Engine" vector processor. Details: This model only is compatible with the 32-bit Geekbench 2 benchmark. These numbers reflect an average of user provided 32-bit and 64-bit results as submitted to the Geekbench website. Higher numbers are better. Details: The processor is mounted directly to the motherboard. Details: The Boot ROM is roughly 1 MB, other instructions are loaded into RAM. Details: 256k on-chip level 2 cache runs at processor speed. Details: *There is one factory installed memory module in a 168-pin DIMM slot and one 144-pin user-accessible SO-DIMM slot. Details: Shipped with a "NVIDIA GeForce2 MX graphics processor with AGP 2X support"
Details: The video cannot be upgraded. Details: This model has a 15.0" TFT active matrix display with a native resolution of 1024x768 at "millions of colors". It also supports "640 by 480 pixels and 800 by 600 pixels". Apple reports a "typical" brightness of 200 cd/m, contrast ratio of 300:1, and viewing angle of 120 degrees horizontal and 90 degrees vertical. Details: Apple reports that this system has a "mini-VGA output port ([that] requires [a] VGA display adapter)" with support for video mirroring at output resolutions of "640 by 480 pixels at 60 Hz, 800 by 600 pixels at 75 Hz, and 1024 by 768 pixels at 75 Hz". Details: This model supports hard drives larger than 128 GB. Details: Apple reports that the tray-loading 32X DVD-ROM/CD-RW Combo drive "reads DVDs at 8x speed, writes CD-R discs at 32x speed, writes CD-RW discs at 10x speed, [and] reads CDs at 32x speed." Details: Internal 56k v.92 modem and 10/100Base-T Ethernet standard. Details: This model could be configured with AirPort (802.11b) at the time of purchase at additional cost. Apple also advertised that the system supported Bluetooth with a USB "Bluetooth adapter" sold separately. Details: This system has three USB 1.1 ports (shared on two 12-Mbps controllers) and two Firewire "400" ports (eight watts shared). Apple advertised that this computer had five USB 1.1 ports, counting three on the system and two on the keyboard. Details: This model has "built-in antennas and [a] card slot for [an] optional AirPort card". Details: This model also shipped with Apple Pro Speakers. Details: 10.6 inch (27.0 cm) half sphere ice white case with a chromed staineless steel neck that supports the display. Details: The Apple order number should be unique to this system. Details: This system cannot run versions of MacOS X more recent than 10.4.11. Details: This model is capable of using Mac OS 9 applications within the Mac OS X "Classic" environment. It cannot boot into Mac OS 9. Details: *In inches - height x width x depth - minimum (32.9 cm, 38.3 cm, 27.0 cm). The maximum dimensions are 20 inches x 16.3 inches x 16.3 inches (50.9 cm, 41.5 cm, 41.5 cm).